Thrive are delighted to introduce the very first tenant to the brand new Foundry House development in Widnes. 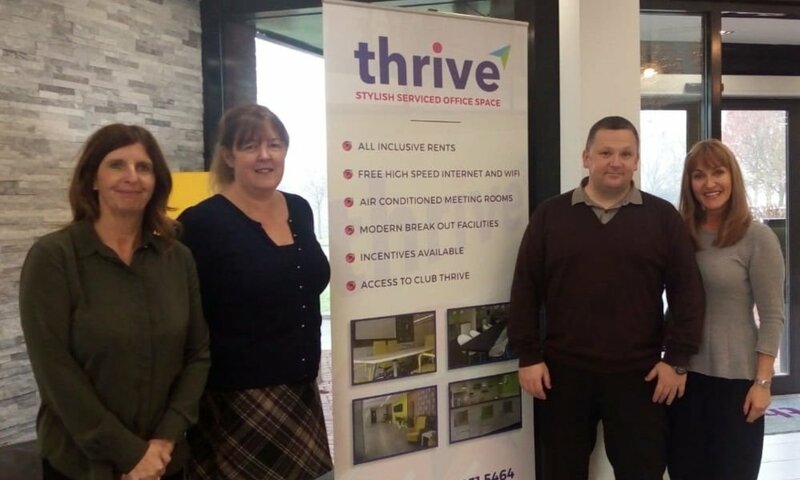 As soon as they saw the offices and facilities available at Atlas House in Wigan they knew they wanted to become Thrive members. They were delighted to find out Foundry House, Widnes was under construction, in their perfect location. Thrive are delighted they have settled into their new office and wish them every success. Exclusive access to the Vivup portal, the first customisable platform where all of your employee benefits and health and wellbeing initiatives can be accessed by your staff in one place. Downloadable fact sheets, CBT self-help Workbooks on a wide variety of common Mental Health issues, Smartphone Apps, On-Line CBT, and links to relevant external organisations. 24-hour helpline: your staff can share a problem with someone who listens with care before getting structured, actionable advice. Telephone counselling: employees can work through their problems with a therapist with extensive public and private sector experience. Vivup Health and Wellbeing also provide specialist NHS experience and knowledge. Face-to-Face counselling sessions: staff can speak with a qualified professional on or off site as required. A diverse range of physical and mental health training packages that can be tailored to suit your Organisational requirements. Please visit www.vivup.co.uk for more information.